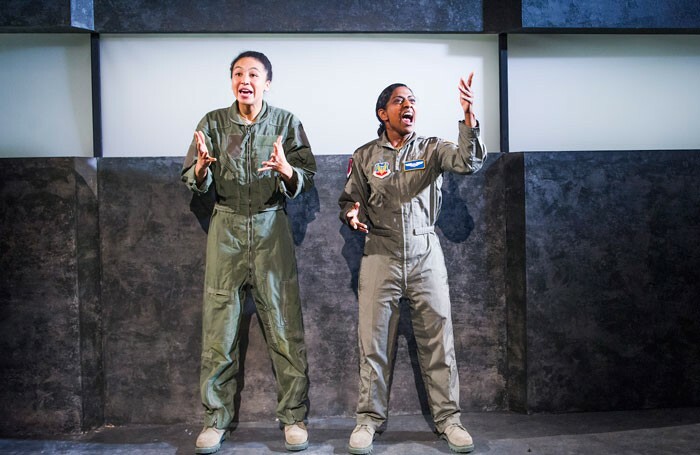 Though George Brant’s play about an American fighter pilot is usually performed by a single actor, Paula Garfield’s production for Deafinitely Theatre casts both Nadia Nadarajah and Charmaine Wombwell in the role of the flyer whose life changes after she becomes pregnant and is reassigned. Nadarajah signs and Wombwell speaks the lines, and together they shape the character between them, the multitudinous nature of her: mother, pilot, sky-god, a woman wedded to the blue. 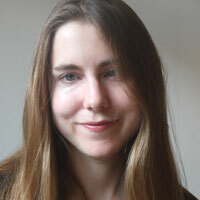 Following the birth of her daughter, she struggles at first to adjust to a new earthed existence, manning a drone from the Nevada desert, obliterating little dots on a grey screen before going home to her family, but she soon discovers that this brings its own thrills, its own kind of power. Anne Hathaway recently played the role in New York, and in the UK memories of Lucy Ellinson’s electric performance at the Gate Theatre, London, are still fresh, but this is a smart, inventive revival and this bilingual staging, so fluidly handled, makes you appreciate the richness of the text anew. It’s an incredibly powerful and intelligent piece of writing, touching on so much about surveillance and modern warfare, and the choreography of the dual performance is also fascinating, the overlap, the connection between them but also the disconnection; sometimes they read as one person, but sometimes they feel more distinct. The splitting of the role in this way is integral to the shape of the production and together Nadarajah and Wombwell succeed in peeling the play’s many layers, its humour, its humanity – its warning.